Dave Norling Jr. is the owner and operator of Rush River Rods, a small company located in Minneapolis, Minnesota. He is a longtime customer of ours and makes products that are seen around the globe. “My father and I make hand split bamboo fly rods which we sell all over the world. We travel with them as well, visiting rod maker gatherings all over the US and Canada (so far). One of the components of our rods is a ferrule (sometimes two or more) which allows for shorter rod sections for travel and storage. The ferrules are made of nickel silver and turned from bar stock on a lathe. My company offers these ferrules online and ships them all over the world. I acquired the company several years ago from a friend who founded it 20 some years ago. It is pretty steady regarding the volume of ferrules we sell, however, the machine work has been farmed out which makes custom work almost impossible and makes it difficult for us to expand into different styles in a changing market. Therefore, about two years ago I decided to set up a Lathe and bring the machine work into our shop. 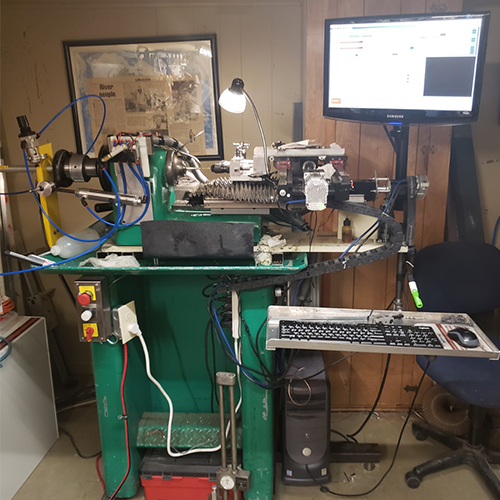 I bought a Hardinge HSL and fit it with a Schneeberger coordinate table which I all but stole off of eBay. Clearpath servo motors added to the mix. 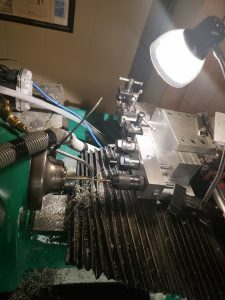 I built my own toolbar, used Hardinge tool holders for three stations, collet holders for two and a drill chuck for the final. This is the fourth CNC I have built,” says Dave. 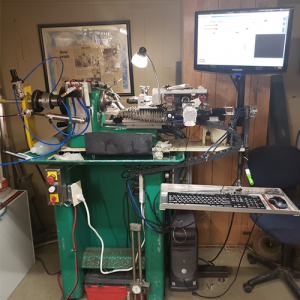 How do you use BobCAD-CAM in your shop? Since he is relatively new to using CAD-CAM, he told me that a lot of the challenges he faces are related to inexperience. However, Dave has invested in training and finds himself learning more and more every day. “As a new user, I found that one-on-one training was unbelievable; such a great learning platform! Especially the recorded audiovisuals of the session. In my first sessions, I replayed them many times as I learned my way around the software… also, the price point, customer service, and functionality of the product are quite remarkable,” says Dave. 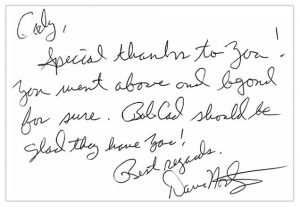 Recently Dave had an interaction with our support staff that left him so pleased, he decided to send us a card expressing his gratitude. 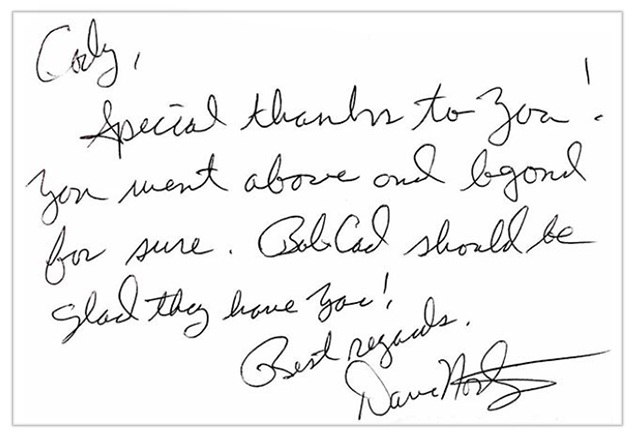 Dave is referring to one of our longtime technicians, Cody Sheppard and how he went above and beyond to make sure he was satisfied. That’s just what we do here at BobCAD, we go above and beyond to make sure our customers are satisfied and turnin’ & burnin’.